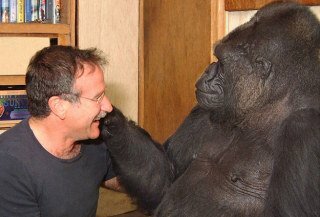 With a friendship spanning almost 14 years, Robin Williams met Koko, the gorilla, at the Gorilla Foundation in Woodside, CA back in 2001. Going deeper than the old cliché: “monkey sees, monkey does,” it's been said that our now-departed beloved comedian and Koko experienced a genuine bond. Williams who would later describe the meeting as “unforgettable,” filmed an ad campaign which was created to assist the Gorilla Foundation raise awareness of gorillas as an endangered species. "Thousands of gorillas like Koko are killed every year by poachers in the illegal bushmeat trade," said Robin Williams. "At this rate, free-living gorillas could be wiped off the earth in a few years,” said Williams. 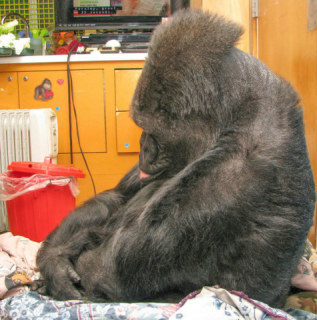 During the visit, Koko used sign language to ask Williams to play with her. “We shared inter-species laughter." joked Williams. He then became an Honorary Co-Chair for the Gorilla Foundation's campaign to assist in the development of the Maui Ape Preserve. Koko uses a modified form of American Sign Language to communicate with humans. She knows over 1,000 words of sign language and has a working vocabulary of 500, which she uses in complex phrases. She also understands over 2,000 words of spoken English, and is said to understand the concept of death and grief. On Monday this past week when the news broke that Robin Williams had passed, Dr. Patterson says Koko came to her with an inquiring look on her face. When Patterson shared the news, “Koko was quiet and looked very thoughtful,” a spokesperson for the Gorilla Foundation said in a press release emailed in response to an inquiry from BuzzFeed. “Koko became very somber, with her head bowed and her lip quivering,” expressing what is being interpreted as her grief for a lost friend. Whether Koko truly understood, it’s comforting to know it may be possible — which only reinforces how much Robin Williams touched not just the lives of people but also one of our closest relatives in the animal kingdom. RIP, dear friend - you’ve created a void that will be hard to fill.